Popular, compact and precise. This tool "tilts, turns and rotates". The grooved jaws have a max. opening of 74mm (2 7/8") and consist of a fibre-reinforced thermal composite alloy. The jaws are controlled with a fine/coarse adjusting knob which is ideal for very delicate operations. 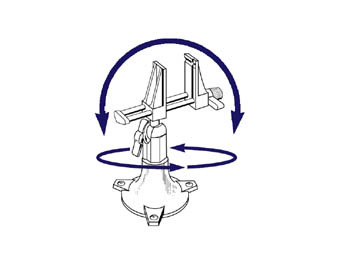 The head moves through three planes : 360° rotation, 360° swivel and 210° pivot and is controlled with a single knob. The world's most PORTABLE work holding tool! Provides all of the "tilt, turn and rotate" versatility of the PV301 Standard Panavise with portability as an extra trump card. 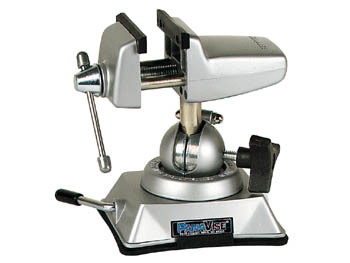 A half-turn of the mount lever attaches or releases the powerful suction pad and makes for a rapid setup in a variety of locations (for use on smooth, non-porous surfaces only).